There are three main types of hardwood floor: solid, engineered and acrylic impregnated floors. Solid hardwood floor made from one solid piece of wood. The thickness of this type of floor may vary from 3/8 to 3/4 of an inch. By the width of wood planks solid hardwood is divided in to three different categories. - Strips – when the width of the wood either 1 1/2 , 2 or 2 1/4 of an inch and thickness from 5/16 to 3/4 of an inch. - Planks – when the width of the wood from 3 to 8 inches and the thickness 1/2 to 3/4 of an inch. - Parquet is usually a certain pattern of specific type of the hardwood floor strips or planks held together with special adhesive or mechanical fastening. All types of solid hardwood floor can be unfinished or prefinished. Unfinished wood has to be sanded and finished after the installation at a job site. Prefinished hardwood comes with already factory applied finish on, and installation has to be done much more carefully in order to prevent already finished wood from any damages. There are some advantages and disadvantages in both unfinished and prefinished hardwood floors. With prefinished hardwood sanding and finishing process eliminated what is good, because it is no dust and smell of finishing materials in the house, but it is limited colors range to pick up from, basically there are standard colors that prefinished hardwood by species coming to the stores. Unfinished hardwood can be colored in any color. It is a wide range of colored hardwood stains which can also be mix to find the right color. With eliminating sanding and staining process the labor cost for the installation of prefinished hardwood floor usually lower compare to unfinished hardwood floor installation, but prefinished wood itself more expensive that unfinished. 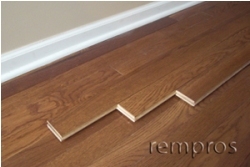 Engineered hardwood floor has two or more layers of wood glued or boned together under the heat and pressure. Sometimes homeowners might think that it is better to have one solid piece of a wood instead of combination of layers, but it is not true all the time. Different layers, combined together perpendicularly to wood grains make the whole piece more durable and much more sustainable to moisture and humidity. Most engineered hardwood floor is factory finished and vary from 3/8 to 3/4 of an inch thickness, but some engineered hardwood available in unfinished option. Top or finishing layer can be different types of species, colors and finishes. The thickness of this layer depends on the type of a product and manufacturer. Some of the high quality engineered hardwood floor products can be refinished as many times as solid hardwood due to thickness of the top layer. Acrylic impregnated floor also have a few combined layers of the wood as engineered, but the main difference is that color applied through whole top layer. Acrylic impregnated floors more durable in comparing with engineered, because of its manufacturing process, and they are also available in varieties of colors. This type of the floor is a good option for heavy traffic areas. Hardwood flooring cost of installation will directly depend on a type of wood flooring.